Data type - Define the application field type. When a field is defined as Document (file name ) type, it stores a file name that is available to the application to process as such. The documents are stored separately in the server. 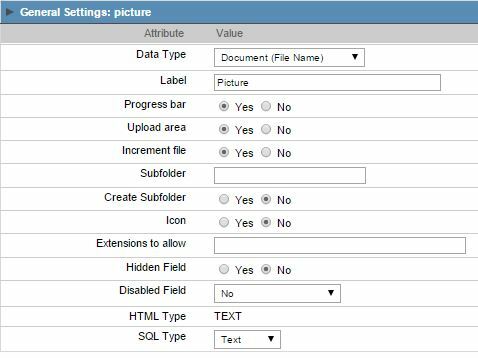 Subfolder - Enter a subdirectory name to save the files in (it is added under the directory defined in the Documents Path attribute in the Application Settings menu. See Settings). It is possible to use global or local variables in the subdirectory name.